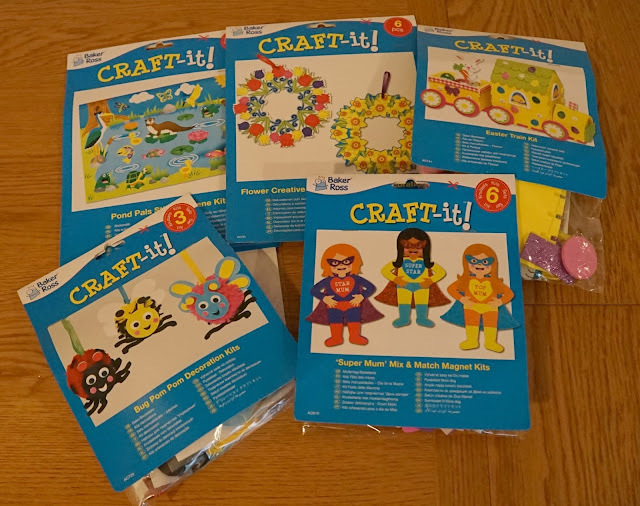 We are part of the Baker Ross blogger network and we get to try out lots of their lovely arts and crafts products. I'm a bit rubbish with craft bits though but fortunately Baker Ross cater for non-pinterest mums like me and have a whole host of easy to do kits on their website! We were sent some exciting bits from their Spring range and Elliot couldn't wait to get stuck in. 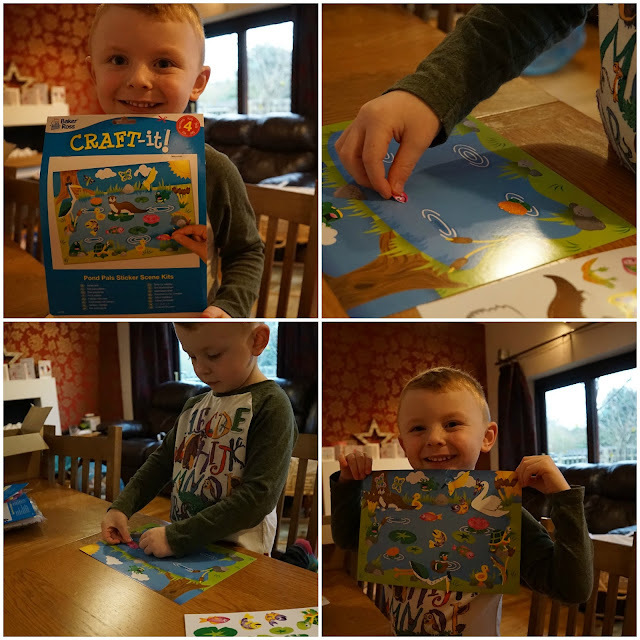 The first thing that caught his eye was the Pond Pals Sticker Scenes (£3.49 for 4). He absolutely loves stickers of any description so this was the perfect activity for him. There come in a pack of 4 and feature animal stickers such as heron, otter, kingfisher, swan, newt, frogs and fish. All the stickers are repositionable so it's an activity that can be used again and again. This was a big hit with Elliot and he's already asked me if Baker Ross do anymore sticker scenes! 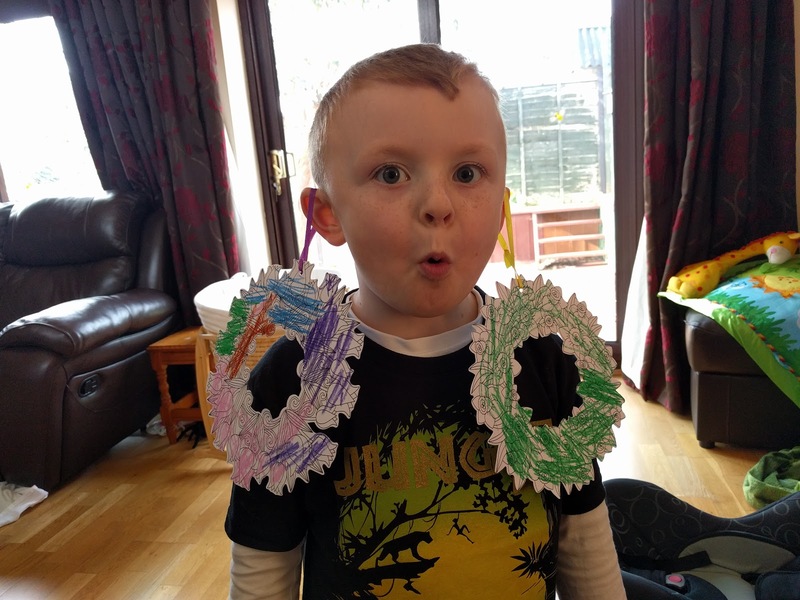 The Creative Colouring Flower Wreaths (£2.50 for 6) was our next activity and this is another perfect kit for the little ones. The flowers on the wreaths are quite detailed and I'm sure any adult would enjoy colouring them but Elliot loved adding a splash of colour! 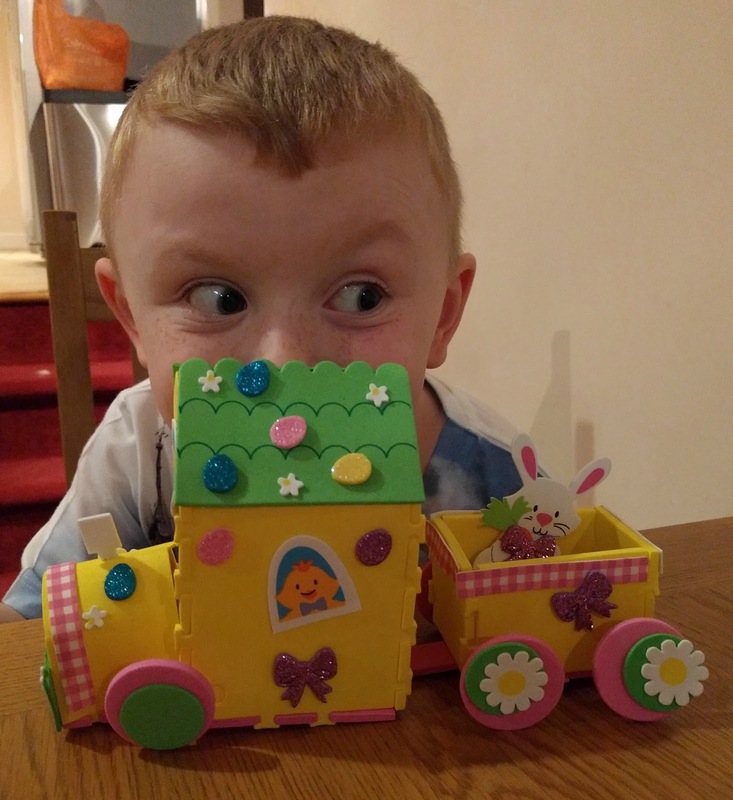 One of the other items we received was the Easter Train Kit (£1.99). This little kit includes foam pieces that slot together and no glue is needed. It does say it is easy to assemble but actually I found this so fiddly!! I knew Elliot would really struggle to do this one as it's aimed at older kids (5+) so I started it off for him but it was quite tricky. I eventually managed to get it all put together and then noticed one of the train walls was round the wrong way meaning the wheel hole was in the wrong area...doh! Couldn't be bothered to take it all apart as it had taken me so long so our train is missing a wheel and probably wouldn't get too far! 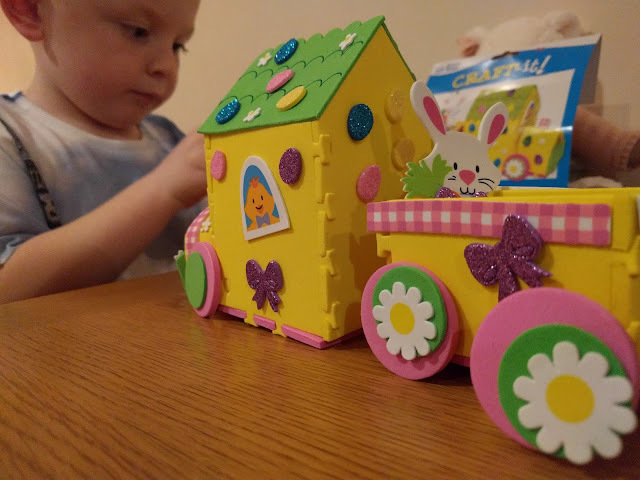 Elliot enjoyed decorating the train but I fear for it's durability.....! Next up was the Super Mum Magnet Kits (£3.95 for 6) which Elliot really enjoyed. 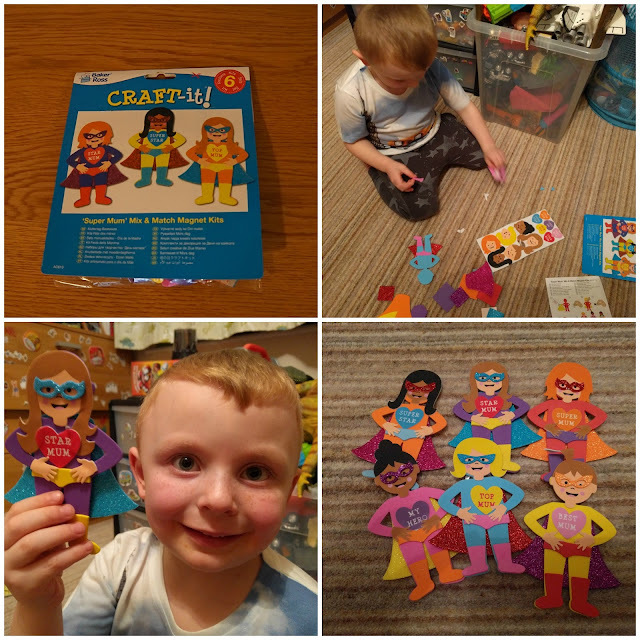 The superhero outfits can be mixed and matched and everything (except the capes) is sticky backed so no glue needed. This makes it a really good activity to do when you don't want to make lots of mess! 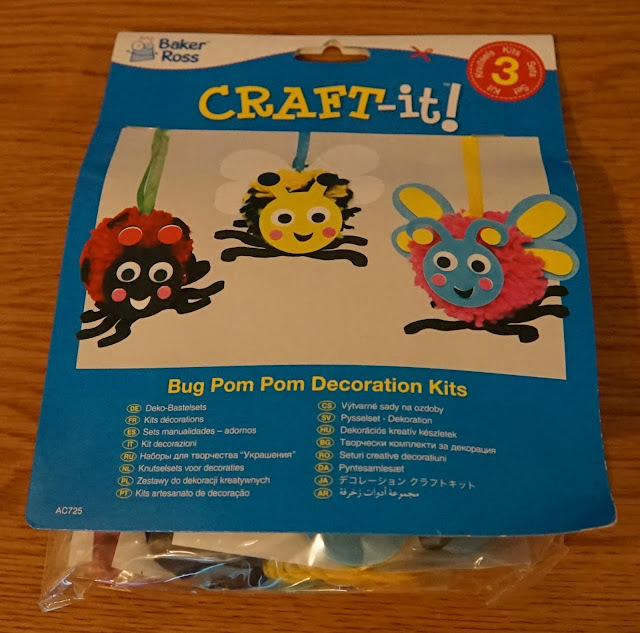 The last craft kit was the Bug Pom Pom decorations (£3.75 for 3) but this looked like it could be a bit fiddly for Elliot to get stuck into so we decided to leave this for another day when he wasn't so tired! Are you a fan of crafts? Do you like ready to go kits like this or do your children prefer something more creative?